Dr. Carmen Mackey, a therapeutic optometrist and optometric glaucoma specialist, is committed to expanding her skills and knowledge to better assist her patients. She currently specializes in contact lens fitting, trauma, pre- and post-operactive LASIK and cataract surgery management and ocular diseases such as glaucoma, diabetic retinopathy and age-related macular degeneration. Dr. Mackey also has a special interest in dry eye and ocular allergy management. Dr Mackey enjoys working with children of all ages to help them see the world in a whole new way. Dr. Mackey was born and raised in the East Texas area. She received her Bachelors degree in Chemistry at Southern Methodist University in 2003. She continued her education at the University of Houston, College of Optometry where she earned her Doctorate of Optometry in 2008. During her studies, she completed three internships and trained under highly skilled ocular surgeons, ophthalmologists and optometrists. Dr. Mackey was one of a limited number of students to receive a Clinical Letter of Excellence recognizing her success in Family Practice. She is a member of the Beta Sigma Kappa Optometric Honor Society and is an adjunct associate professor at the University of Houston College of Optometry. Dr. Carmen Mackey and her husband Ryan have been married since 2004 and currently have three children Falon, Ivy, and Bailey. They strive to live a Christian lifestyle, and know that it’s all for Him. 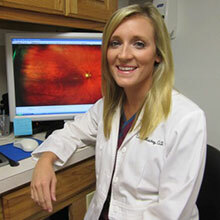 Dr. Mackey is proud to be back in her hometown providing top quality eye care to all in need.